Back in April 2017, the proposed Hilton Hotel in downtown Hoboken, years in the making with a very public process came before the City Council and eventually saw passage short of two votes. The two council members voting against the years-long drawn-out affair? Ravi Bhalla and Jim Doyle, with the former telling members of the public, the hotel was too large a footprint and too large a scale for downtown. What changed leading to the Ravi Bhalla flip-flop? Political ambition, campaign coffer registers and special interests all adding up to the loss of Hoboken sovereignty. 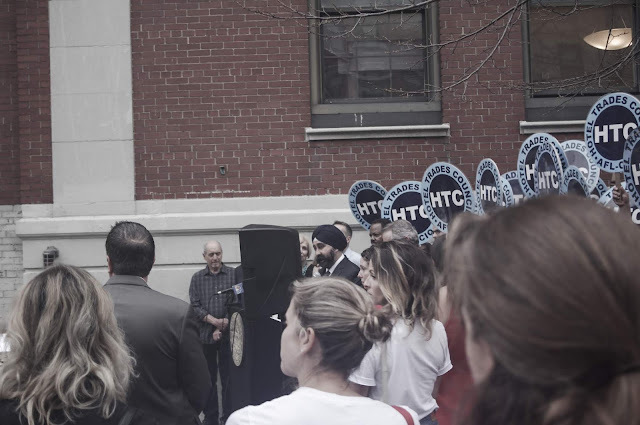 Putting aside the larger seven figures in givebacks spread about due to independent City Council leadership uniting with the broader interests of Hoboken and other public voices, it's Mayor Astroturf Ravi Bhalla going all in. The Stronger Foundations construction unions kept invisible and silent sending in hotel union workers to dominant the Mile Square landscape. This is what Astroturf Ravi looks like. What does it mean for Hoboken? Can you say NJ Transit? A sea of union astroturf AFL-CIO signs envelope Ravi Bhalla at yesterday's announcement on the Hilton Hotel revised agreement. It signals the surrender of Hoboken sovereignty to special interests, courtesy of Mayor Astroturf, Ravi Bhalla.